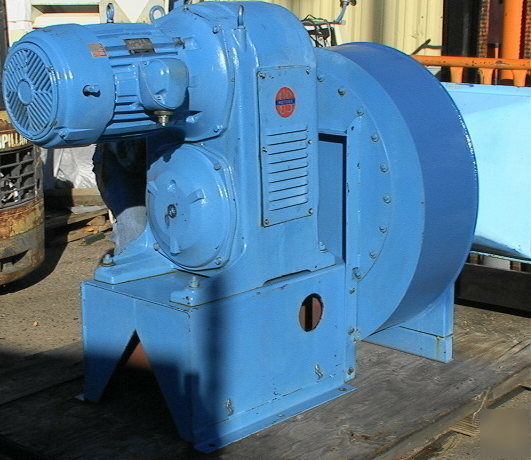 Variable Speed Buffalo Industrial Exhauster Fan Blower Size 40 Type MW 25hp. This centrifugal fan unit has a mechanical variable speed drive that allows one to select the exact speed you want to run the fan, over a very wide range. At mind speed, we measured the airspeed leaving the unit at 80 to 90 miles per hour. This implies a top speed around 170 mile per hour (our anemometer tops out at 135 mph and we popped our circuit breaker before we could get all the way to full speed). We are still waiting to hear back from the factory regarding the specs for this unit but our measured results indicate this blower is capable of something on the order of 12,000 cfm. The crank and dial in the image above are for adjusting the blower drive speed. For those of you who want to know what this fan can do, check out the curves below. The images here show the mechanical (belt) variable speed drive. The belt and variable drive sheaves shown no sign of wear. The "v-belt" is about 3 inches wide. The current intake scoop is about 50 inches wide by 24 tall. The actual entrance to the fan is about 17 inches diameter and the blades are about 10 inches wide. There is no significant sign or even the paint wearing off the fan blades. The diameter of the fan drum is something over 37 inches. The present outlet duct is about 12 inches diameter. Overall dimensions are about 6 feet long by 5 feet wide by 53 inches tall. Might be just what you need for your high velocity variable speed fan application. Condition looks good older-only slightly used.